Inversk Street Ingrate Unmasked, originally uploaded by alister. Nearly! Identity changed to protect the guilty. But seriously, nice to meet a fellow blogger especially one from Dunfermline. Our Flag Stays Red, originally uploaded by alister. Edinburgh Mayday 2005, with speakers from Greens, SSP, Make Poverty History and a great speech from writer AL Kennedy. Plus music and a beer tent! Heard a good one about a hustings in Edinburgh's Muirhouse estate which, for those who don't know it, is not exactly Morningside. The candidates all faced questions and one came up about PFI/PPP schemes. The chisel-jawed ex-SAS tory candidate did not shrink from answering. "It's just like having a mortgage, I mean we all have mortgages right? Everyone here has a mortgage." Cue howls from the majority of council tenants at the meeting. New frontline out now with a series of articles on Marxism and the SSP, plus Sinn Fein's crisis, socialists and islam (which should get a few backs up, and for the record I have differences with the article myself), gramsci and more. Love, the ed. French voters are getting ready to give their rulers a bloody nose over the European constitution. Hear about the black sheep calling for a NON from Compagnie Jolie Môme avec MP3's. And while you are in a European mood check out the great antifa-hooligans video from Italy's Los Fastidios. 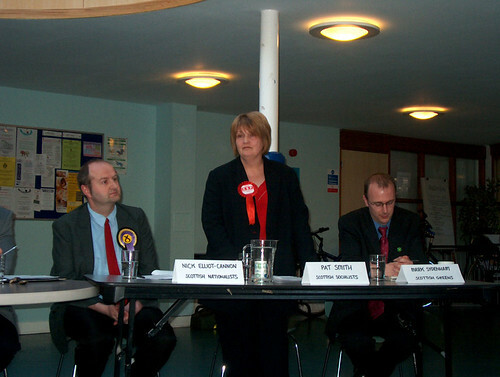 Hustings, originally uploaded by alister. The rest of the candidates at the hustings. UKIP loon not pictured. Move Over Darling, originally uploaded by alister. In my experience it is rare for all the candidates to actually show for a hustings. But for some reason they did for this one, an 'environmental' hustings in my local community centre called by what a cynic would regard as various Green Party front groups (sorry Mark). As is not unusual the best speaker was the SSP candidate Pat Smith. Active campaigning socialists actually have more experience in public speaking and communicating with people than most politicians and would-be politicians. A polished and eloquent performance. 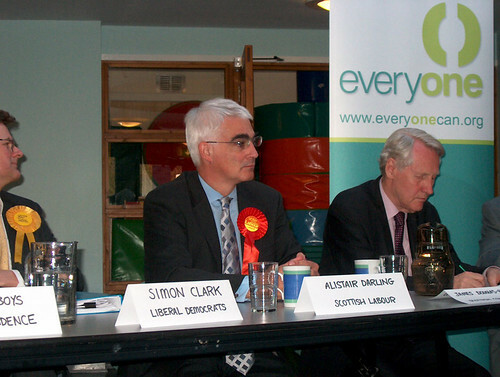 That said, Alastair Darling was fairly slick. He has all the requisite political skills of dodging the question, answering a different question and passing the blame. When he was pinned down he always managed to wriggle out. An eloquent denounciation of him by an anti-war campaigner (of the middle class women-in-black type rather than, well, my type) was evaded as the questioner heckled him throughout his answer, so he effectively got off the hook as no one could hear his mealy-mouthed response. When pinned down over the M74 motorway he just said it was a matter for the Scottish Executive, yeah but what do you think Mr Darling? He was also helped by the UKIP candidate who was such a space cadet that attention started to be focused on him as he declared his support for nuclear power and our "nuclear deterrent". He was against the EU but in favour of a world government. Right. As we all laughed at him we forgot that New Labour are also in favour of our own WMD's at Faslane. Off the hook again. The rest were a mixed bunch. The Lib-Dem seemed unaware of his own manifesto and constantly pledged himself to stuff that wasn't in it, he was a nervous fidgety character too and the audience began to scent blood. Stand-in Tory Lord James Douglas-Hamilton did his usual patrician charmer act. The SNP dude (who to the SNP's credit, was English) mumbled so much that the audience revolted and began to give him quite a hard time. I felt a bit sorry for him myself, he was terrified and seemed like quite a nice guy. The Green (another stand-in) was on home turf and knew his stuff on the environment, but you would expect him to. There was something of a suppressed chuckle around the room when he announced his occupation...recycling cycles. The biggest idiot of the night though was a tory councillor who declared that public transport was bad for the environment as buses pollute more than cars. It was none-too-gently explained to him that you can get more people in a bus than a car. But a turnout of 50 people can't be too bad, and not all of them were party hacks. Blogging the Blair Ditch Project with lots of stuff from Reg Keys campaign in Sedgefield and flickr photos here. "Cardinal Ratzinger ran the Congregation for the Doctrine of the Faith. This Vatican department, a descendant of the Holy Inquisition, protects Church orthodoxy. The job earned him unflattering nicknames such as "The Pope's Enforcer" and "God's Rottweiler". Where's Nemesis the Warlock when you need him? I know you don't care, but I just foundKevin Seconds Paw[d]cast Radio Show, with podcasts from the 7 Seconds frontman, that's him on the right-hand nav bar under where it says gig pictures. No 7 Seconds in C4's top albums, what a shocker. John Naughton has written a column in The Observer looking at the photoshopping of election material, and he includes my effort in his blog. And now I think we're all heartily tired of altered posters. We can take the piss out of Blair and Howard all we like, but they are still going to get back into power, with the agenda shifted even more to the right. On the bright side, the launch of the SSP manifesto today should provide us with our alloted 5 minutes of media coverage for this election. Get your pre-election kicks at the Edinburgh Mayday 2005. This year with a beer tent! It's really hit the big time. 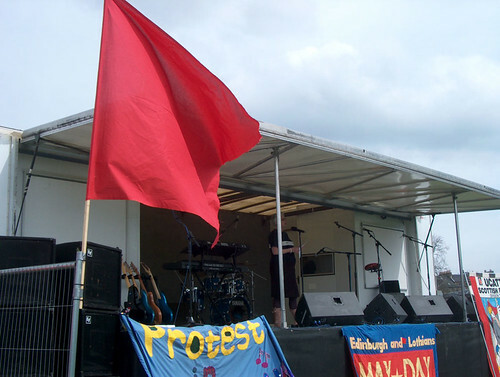 Mayday in Edinburgh has been revived beyond recognition in the past few years since some local trade-union branches and socialists put some enthusiasm and imagination into it. More electoral photoshop fun with the Grauniad's doctored Ed Matts photo gallery. 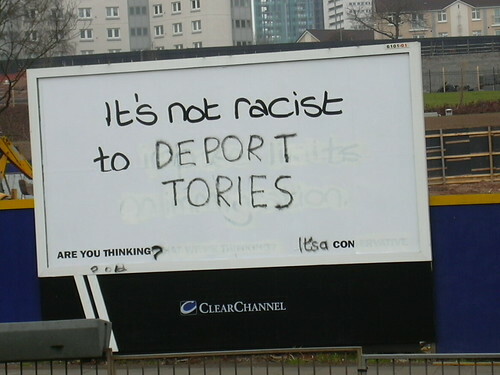 subvertised labour election poster, originally uploaded by alister. 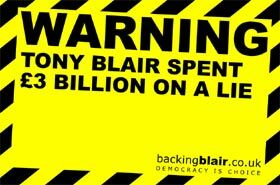 You may have seen New Labour's version of this poster around the place. I have also added this to the Guardians Blair Watch Project. See, I can put Photoshop (and Illustrator) to better use than the tories. The story about the Tory candidate doctoring his election piccies to make him seem just a tad more anti-immigration is sadly not unbelievable. Hmm, think they used the healing-brush tool on the old wrinkles too. Wow, Stalin would have loved Photoshop. But the tories aren't the only ones. There is also the boss of Siemens who had his Rolex photoshopped out - apparently it didn't go down well when making redundancies. Not to mention Deutschen Bank and the amazing disappearing board members. So I pop out to the supermarket to get a lunchtime sandwich and something for the tea later and Tony Blair and Gordon Brown show up for a Labour rally at the next door Corn Exchange. And I took my camera out of my pocket this morning. Arse. Unfortunately the new best-mates honestly didn't do a walkabout as I would have been happy to share my opinions on social policy and international relations with them. 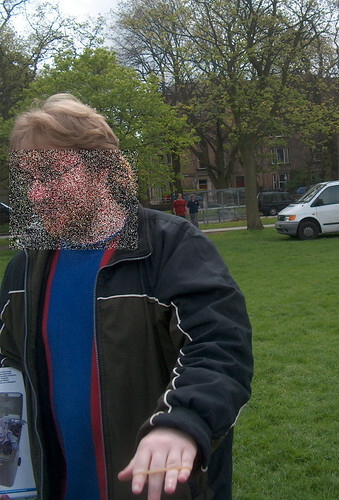 Maybe I should get one of them camera phone things. Me, Start a Vanguard Party!? Jesus, phone canvassed twice by the Labour Party already. And leafletted and my neighbours have been physically canvassed and the place is covered in billboards. Welcome to the seat formerly known as Edinburgh Pentlands. Guess Alistair Darling is a little worried. Time for a break from parliamentary cretinism. A handy checklist guide to setting up your own vanguard party. From Radical America volume 11 no 4, August 1977, hosted on the Early American Marxism pages on the Marxist Internet Archive. And found via the 'spotters. Interesting to see a lengthy article in the Sunday Herald looking at the Pollok Free State, which I recalled recently. There are a number of interviews with the leading participants. But focusing on the personalities seems to be the main thrust. Hardly any of the organisations involved are mentioned, Scottish Militant Labour is mentioned but not Earth First or the Scottish Defiance Alliance. The significance of their united front is barely dealt with nor is the important role the SDA played in the formation of the SSP. But the fact that Rosie Kane, Tommy Sheridan, Mark Ballard and Mark Ruskell are in the Scottish Parliament is prominently mentioned. I guess that focusing on personalities makes for better reading but it doesn't make for a serious history of the Pollok Free State and the anti-M77 movement. "The black-and-white days of fighting the system are gone. We’ve had eight years of Labour government, we’ve got a Scottish parliament. Utopia ought to be within reach, but is proving a more complicated matter than anyone believed in the heady days of Pollok Free State." As if the mid-90's were the heyday of popular protest, you must be kidding. 1995 was hardly 1968. With the anti-war and global justice movements now, we are seeing a much higher level of political consciousness particularly amongst young people. Some new things online from a Scottish lefty perspective. Firstly we bring you Radio SSP, with the first programme looking at the g8 and their forthcoming visit to Scotland. Well worth a listen. Secondly a new blog with a distinctly Orwellian theme, Duncan Light's Homage to Catalonia. And you will soon be getting the first of the SSP general election candidate's blogs. More to come on that. DSCN0313, originally uploaded by Billy Niblick. From a mysterious new blog which has the vague smell of Labour about it ToryScum. 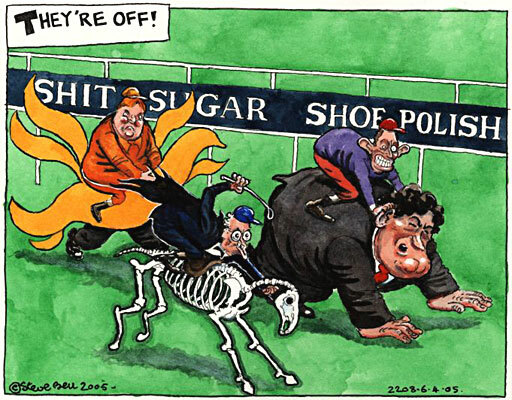 I also like their celebra-tories including Jonathan King, Charlie from Busted and Jim Davidson. And one does have to raise an eyebrow at Michael Howard's hints of Labour anti-semitism directed against him. Persecuting gypsies and asylum seekers is fine though is it Mike? With Scotland's new constituency setup I find myself in a seat more marginal for Labour and so looming great black and yellow New Labour billboards abound. In fact two thirds of the advertising space in the constituency seems to be taken by them. No pictures of Tony Blair though, funny that? OK the one above is not from Noo Layba but from the grauniad flickr page (see below). 8 blogs from Channel 4 News! And egad! they have a flickr page too, catching on a bit quicker this time. And we have seen a few new election blogs such as eh, the 2005 UK General Election blog, via Nick. Kevin reckons he knows something you don't. Cos you couldn't get a fag paper between the 'main' parties - Kill Iraqi's/Subsidise Big Business/Privatise Public Services/Persecute Minorities. Vote for an alternative to the anti-human neo-liberal crap. Vote Scottish Socialist Party, Forward Wales or Respect. If they're not standing in your constituency vote Green. If you're lucky enough to have one of the tiny number of socialist Labour MP's vote for them. But vote for what you believe in. 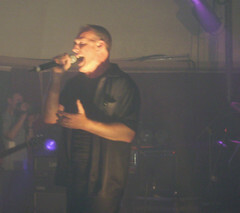 Checking the old logs I see that Only Angels Have Wings : Concert report: Low uses one of my pictures. Nice wee online fanzine. Hauf Jaiket is a new Scottish mp3 blog, most welcome. And speaking of tunes the merry month of May is shaping up to be a good one with visits to embra from ex-minutemen, ex-firehose and sometime stooges bassist Mike Watt with his "el mar cura todo in europe too" tour 2005; and also a club gig from the mighty Teenage Fanclub whose Grand Prix was recently voted best Scottish album of all time (and quite right too.) And the Go-Betweens are coming to the wild west with a gig in Glasgow. And I see that the Fall are playing on the same night as Karl Heinz Stockhausen at the Tryptych festival, end of April in Edinburgh. Compass are contract caterers and own Scolarest, whose delicious mechanically reconstituted meat based dishes featured so prominently in Jamie's School Dinners. But they blame their drop in profits, not on school dinners but on losing military contracts. In fact they proudly say that they have had a number of contracts renewed recently. So in other words their stuff is not good enough for the troops, but is fine to feed to our kids. Compass spin it quite well though, saying that the problem is that the government don't provide enough money per meal. But isn't that the idea of 'best value' - that the contract goes to the company who can meet the minimum standards at the lowest price? School meals should be brought back in-house with decent wages for staff. And they should be free and nutritious for all our kids.